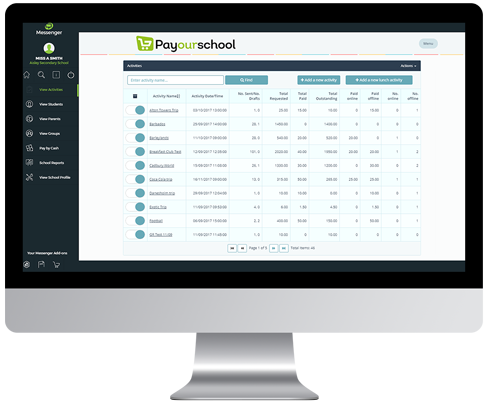 This guide is a set of recommendations for schools that use Messenger Payments (PayOurSchool) for lunch balances and top-ups, integrated into a cashless catering system. It is intended to advise how to handle the end of year process around those balances and outstanding monies. Since Messenger Payments requests money for activities on demand, there should be no credit or debt involved in these processes (outside of refunds individually). Therefore, this guide is ONLY concerned with the lunch balances. This particularly applies for school leavers (Year 6/11/13 students or other leavers) where parents should be encouraged appropriately to spend what is left and/or not top up unless needed to get their children to the end of term. Vendors for the school meal systems will provide you with an end of year policies and procedures to manage balances. Most systems allow balances to be carried over to the next academic year. Assuming the linked cashless catering or school meals’ system allows balances to carry over to the next academic year, Messenger Payments and the cashless catering system will continue to be synchronise as normal. Parents should be encouraged estimate how much credit is needed until their child leave schools so on their last day the credit will be reduced zero on their lunch balance at the end of the school year. You will have your own policy about the limit at which a refund is made. This is often set at the standard cost of a school meal. Refunds can be made in the usual way via Messenger Payments. It is poor practice for negative balances for students remaining at school to be moved to the next academic year. Make every effort to clear the debt. However, debt will continue to be synchronised between Messenger Payments and the cashless catering system when the new term starts. If a student balance is in debt once they have left the school, this will need to be recovered outside of Messenger Payments. Any balance adjustments should be made in the cashless catering or other third party system, where the balance changed will then feed back into Messenger Payments. The end of year/new academic year process is automatic within Messenger Payments, and relies on the information from your MIS and Messenger. Leavers will automatically be archived, and the students will all be put into their new groups as that information becomes available from your MIS.